Finally! It only took a year of hand quilting in between baby number 3, but it is finally finished. Sloan has named it her, “Summer quilt” and has called it such for the past year. 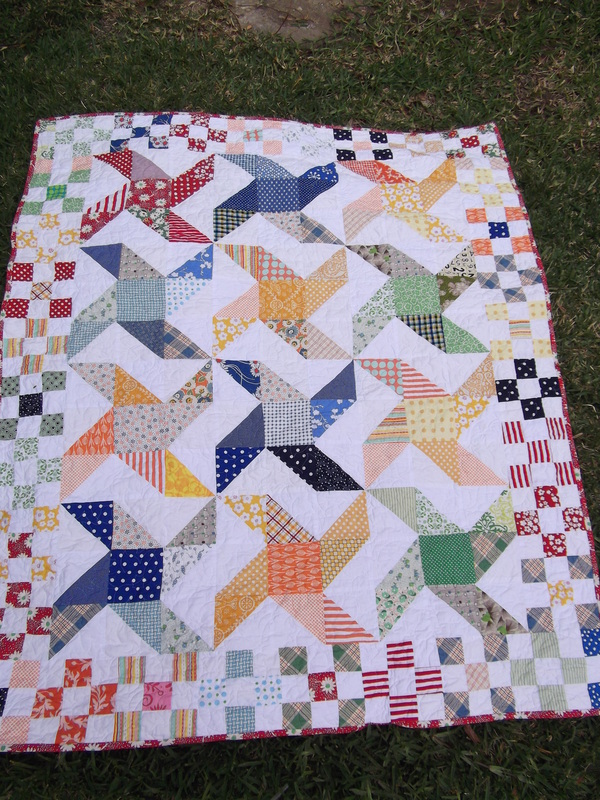 The fabric is from Prints Charming and the design was inspired from one of the quilts in the Material Obsession books. I have one happy little girl and seeing her sleep with her new summer quilt is the perfect reward after all the hours of hand quilting. What do you get when you mix a four year old and a craft project? Lots and lots of color and ideas. 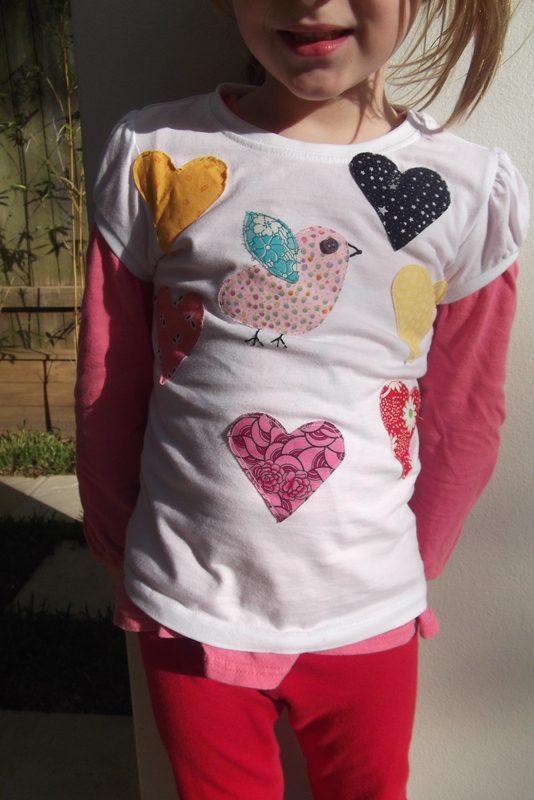 What initially started as a t-shirt with a small bird escalated into the following photo. Her enthusiasm was contagious and I just let her run with the ideas she kept spurting out. It makes me smile to see her in it even though that shirt will be too small in a short amount of time. I hope these projects will give her good memories when she is older. It has been a long year! Our third baby is turning one and the past year has been a fun filled, sleep deprived blur. I was just showing my older two kids the blog and remembered how much fun I used to have posting. I have been working on a major project that is almost finished so hopefully will be able to post some photos soon. 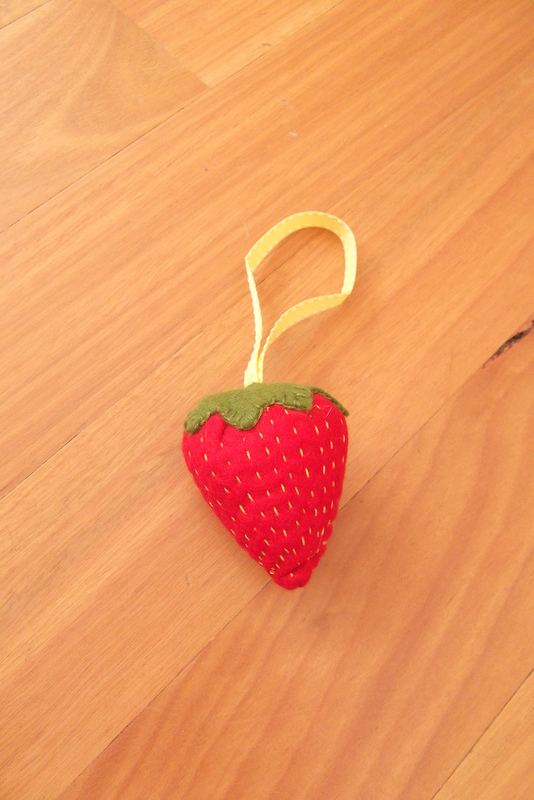 In the meantime here is a project that has been lingering in the craft basket for some time. 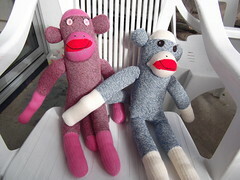 The pattern and kit came from Heather Bailey and was so easy and a joy to make. I can’t believe I have had it in there for so long. Here it is in all it’s completed glory. Hopefully some more projects that have been left collecting dust will see the light of day. 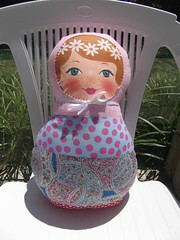 Quick and easy doll for Sloan’s fourth birthday. She loves it and it was way too easy to make. I bought my face and fabrics from Material Obsession. The doll is made by http://www.theredthread.com.au. I wrapped up the fabric and doll instructions for Sloan to open on her birthday and it made a great project present instead of the regular plasic four year old toys. Big hit with her friends too. Prints Charming hosted the most amazing sale the other weekend. We arrived a hour after opening and the place was almost cleaned completely out! I did manage to steal away these gorgeous panels for a new quilt for our little girl S.
It is coming up to the end of school and sewing term, so I brought these along to get some help with in terms of alignment and what to do with the actual panels. 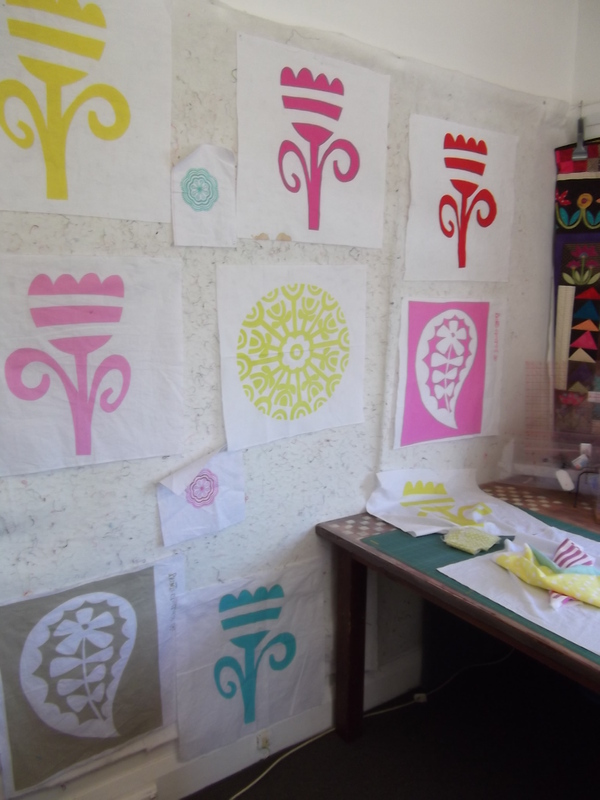 I had a few ideas, but it is always so helpful to get your project or intended project in front of a group of like minded ladies who like to sew and the added bonus of using the design wall. I was short one panel and was going do make a pieced middle when Kathy of Material Obsession came to my rescue and found a panel by Prints Charming that matched perfectly. It is the panel that is now in the middle of the quilt. 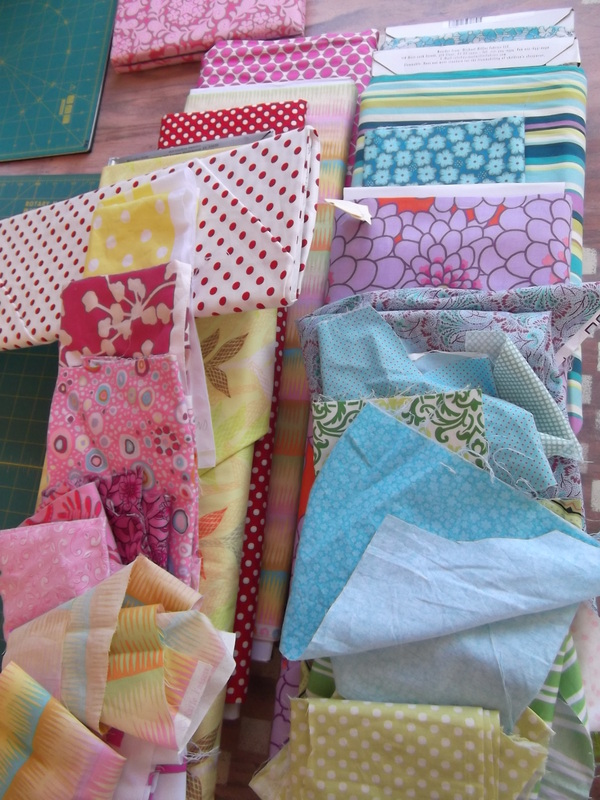 Next thing to do was to start pulling fabrics and trying to sort out the border for the new project. I think we got some winners in the pile and I am going to be incorporating lots of my stash. Somehow whenever I use something out of my stash I feel so good because I think I can go out and buy some more new fabric. Is that crazy or what? I have been working away at night at a new quilt for baby number three that will be born in a month. Can’t believe how the time is going by so fast! Never enough time to get all the projects sorted. It isn’t helping me that this project walked into the shop while I was there. I can’t get it out of my head and I know I will have to make it……..it is meant to be.